Home LifestyleMarriage	I love my husband!!!! Time out from baby talk to say a HUGE internet online thank you to my amazing husband who surprised me with THIS last night!!! 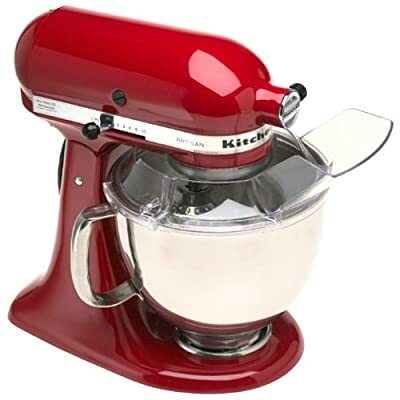 Probably the only item on our wedding registry that I could not stop thinking about, this mixer has been the topic of much conversation and laughter over the past couple years. We would go back and forth about why I NEED it and why he thinks I don’t. Well this year I had no expectations whatsoever as I finally got a satisfactory “we’ll get it one day”. And let me tell you I had no plans to forget that sentence 🙂 SO imagine my delight when I came into the kitchen to take his birthday cake out of the oven (coincidence???) and I saw it sitting on my counter! My jaw dropped!!! It’s not so much about a material thing, but the fact that he has been listening all this time and planning and wanting to surprise me. I LOVE that! I am so grateful to be blessed with such a thoughtful husband! He said he was going to wait until Christmas but he thought I might want to play with it that day. And he was right!!! Now I have to decide what I want to do…My mom is handling potatoes so that’s out. That is so incredibly sweet of him! Great suprise 🙂 I think you should make something absolutely delicious, maybe your favorite couply desert? either way, this mixer could handle it!